The University of Florida Mindfulness team has created the Mindfulness Wave to teach ways of approaching life and promote positive mental health among students and faculty all across the UF campus. For the past year, UF Mindfulness has used funding provided by the Creative Campus Initiative to spread mindful practices. This semester the team started hosting Mindfulness Waves for professors and students from each college to pause, focus on their breathing and empty their minds in order to be more efficient in and outside of the classroom. Ana Puig, Counselor Educator and Research Director of the Office of Educational Research at UF, said the wave idea is about reaching every college on campus. These sessions are not standardized though; they differ each time from college to college. According to Puig, research done with medical and some business students to integrate mindfulness into the curriculum resulted in mixed feelings. Some students felt there was too much work to get done to spend time just sitting. On the other hand, during a wave session in the College of Education, Puig noticed students were grateful for the opportunity. “People who choose to participate find it useful,” she said. Puig also explained how mindfulness can bridge the disconnect between students and teachers. She said a mindful teacher talks with the student instead of talking past them. “Students who feel present with teachers experience better quality relationships.” These enhanced relationships ultimately improve the student’s educational experience. However, this way of thinking is not for everyone. It’s a paradox: taking a break from a busy schedule to become more productive and focused later on. 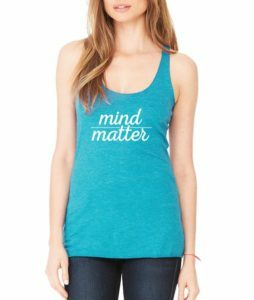 “Mindfulness is not something that you talk about or read about—that’s actually not being very mindful. So mindfulness is something best experienced by practice,” Grunwald said. Methods of achieving mindfulness include tai chi, qigong, yoga and mindful walking. The productivity from being mindful stems from “not getting caught up and having the ability to stay calm,” Grunwald said. “We can spend hours surfing the internet, and we don’t even know where we are. So often we are lost… and we already have the desire for the next thing. Not worrying about the future and not getting hooked on the past,” is how Grunwald explained the goal of being mindful. During the meditation process, Puig said to refocus on breathing if a negative judgment comes after a thought. It will “bring peace to the heart and everything passes,” she said. Accepting this mindset benefits students because it’s a process that can be done without the aid of doctors and therapists, which are often expensive for students. Another initiative that the team wanted to bring to campus was a UF gong. This would be something similar to the ringing of Century Tower but would be a symbol for everyone on campus to take a moment to stop and meditate. “It was a simple concept that never came to be,” Puig said. Rachel Surette, a sophomore public relations major, has not attended a wave event, but sat on a tarp to meditate on the Plaza of Americas with the Mindfulness Team. “Coming back to campus after spring break I was hit with a couple exams and papers to write,” Surette said. “I definitely released some tension that had built up from studying.” Surette said she will be attending the next wave event hosted in her college. Until then, the UF Mindfulness team can be found sitting peacefully on the Plaza of the Americas on March 17 and 31, and April 7 from 1 p.m. to 2 p.m. Goals for UF Mindfulness include hosting sittings in the new meditation room in the Reitz Union. 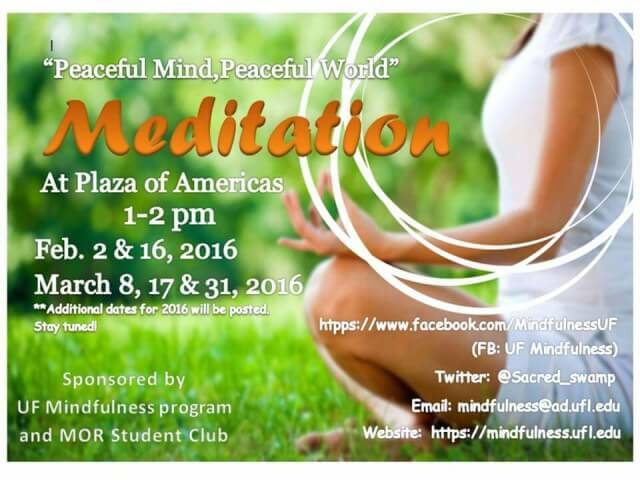 Additional meditation dates will be listed on the UF Mindfulness website soon.